New Cat®C13 ACERT™ and C15 ACERT™ engines feature integrated design and provide improved fuel efficiency and productivity for next generation machines. C13 ACERT anda C15 ACERT engines have received the United States Environmental Protection Agency’s (EPA) Tier 4 emissions certification. The engines are the latest to receive certification in the 130 – 560 kW power category. The C13 ACERT and C15 ACERT in addition to the previously announced certified C9.3 ACERT engine families will power a number of Cat products including mid-range track-type tractors, motor graders and hydraulic excavators in a wide variety of customer applications. Additionally, the C9.3 ACERT engine and its 13- and 15 liter counterparts are offered in several configurations and ratings for use by customers in the industrial, agriculture and petroleum markets. "Our Tier 4 focus is not just about emissions – it is about the customer, as well" said Marketing and Product Support Vice President, Steve Gosselin. "Our ultimate goal is to exceed expectations by developing products that are more efficient, add more customer value and reduce emissions without sacrificing performance." It is projected that Caterpillar will accumulate nearly one million hours of testing on Tier 4 Interim//Stage IIIB engines and machines by the end of 2010. For more information about Tier IV Interim regulations, please visit Ring Power's new Tier IV website at http://emissions.catdealer.com/ringpower . Ring Poweralways strives to keep our customers informed and up to date with the latest information pertaining to you. That’s why we’ve launched a brand new website explaining the United States Environmental Protection Agency’s Tier 4 emissions regulations and what it means for you, the business owners, customers and hard workers. Ring Power wants to help educate our heavy construction equipment and power systems customers on this detailed new regulation so that they can be informed to make the best business decisions possible. It is always our goal to serve you. Please read for more information on Tier 4 below and then visit our new website at http://emissions.catdealer.com/ringpower. The United States and European Union (EU) are implementing significant regulations that mandate the lowest emitting non-road equipment in history. Canada and Japan are expected to release similar regulatory programs yet this year. These regulations, which are known as U.S. Tier 4 // EU Stage IIIB/IV, will result in non-road equipment approaching near-zero emissions of particulate matter (PM) and oxides of nitrogen (NOx). Transition to these standards is challenging for non-road equipment manufacturers. 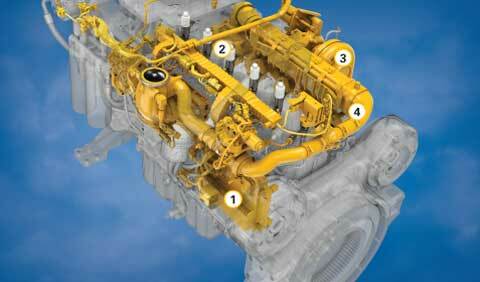 For Caterpillar alone, hundreds of complex products with unique and challenging application spectrums must be re-engineered to accommodate the lower emitting engines being developed to meet these standards. Regulators recognize the challenge and the difficulty non-road equipment manufacturers would face if they had to introduce all of their new lower emitting products on one particular date. To address these transition challenges, the U.S. Environmental Protection Agency (EPA) has allowed for implementation of the upcoming emission standards in two phases: Tier 4 Interim and Tier 4 Final. 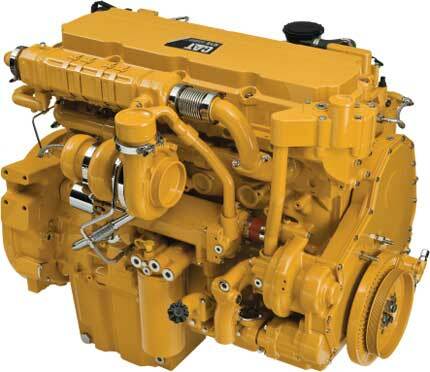 Tier 4 Interim is effective 1 Jan 2011 for 130-560 kW non-road engines and 1 Jan 2012 for 56-130 kW non-road engines. Tier 4 Final emission standards apply after the 2014 model year. The EU’s Stage IIIB and Stage IV emissions levels and regulatory dates are essentially the same as EPA’s. In addition, under its Transition Program for Equipment Manufacturers ("TPEM," which is commonly known as the "flex" program), EPA also allows equipment manufacturers to continue to introduce equipment powered with engines meeting prior Tier emission requirements for a certain limited percentage of their overall production volumes during the Tier 4 timeframe. The EU also has a "flex" transition program, as well as a unique "sell off" program, both of which allow equipment manufacturers to continue selling prior Tier machines in order to allow for a smooth transition to the more stringent EU emission standards. These transitional programs are calculated into the environmental benefits regulators forecast when developing these programs. Caterpillar has a robust Tier 4 introduction plan, which is structured to transition from Tier 3 to Tier 4 products in a smooth and orderly fashion utilizing a variety of the transitional tools provided in the regulations in order to maximize value to you, our customers. Please visit our new website to learn more about Tier 4 at http://emissions.catdealer.com/ringpower . The emissions education website also has contact information for Tier 4 Specialists at http://emissions.catdealer.com/ringpower/contact-us . The Dirty Jobs creator and star is teaming with the company to showcase Caterpillar Customers, Dealers and Employees. Caterpillar Inc., the world’s leading manufacturer of construction and mining equipment, diesel and natural gas engines and industrial gas turbines, has announced that it is partnering with Mike Rowe, the creator and star of the Discovery Channel’s Dirty Jobs and founder of mikeroweWORKS.com. With Mike’s dedication to the trades and Caterpillar’s commitment to its customers, the two have joined forces to highlight the important and essential work Caterpillar customers perform everyday. Rowe will be spending time with Caterpillar customers and dealers to get a real world perspective on their jobs and how the two partner to be successful. These encounters will be featured on cat.com and at Cat Dealerships across the country and will be used to demonstrate the solutions that Cat Dealers provide their customers throughout the lifecycle of their equipment, highlighting their superior parts and service support. Rowe, who calls himself a perpetual apprentice, has performed more than 300 jobs in locations around the country via his show, Dirty Jobs, which is currently one of the Discovery Channel’s most popular programs. Mike is also the creator of mikeroweWORKS.com, a website dedicated to and for people in the trades to meet, discuss relevant topics and learn what is the latest in the industry. He says his partnership with Caterpillar was “inevitable” because the two share the same work philosophy. 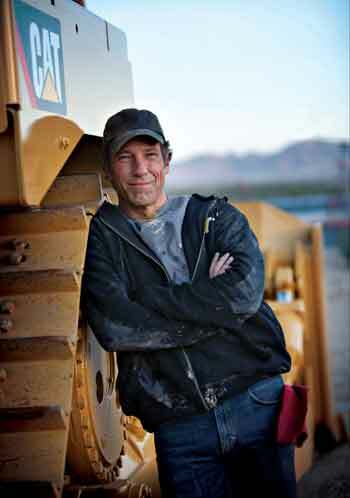 Click to learn all about Mike Rowe, Caterpillar and Ring Power Corporation. From paving contractors throughout the state to the forests of Northwest Florida to the mines in central Florida, Ring Power is there supporting Florida's contractors and tradesmen with quality Cat parts and dependable service for their heavy equipment, both large and small. Ring Power is North and Central Florida's Caterpillar dealer and headquartered in St. Augustine, Florida. 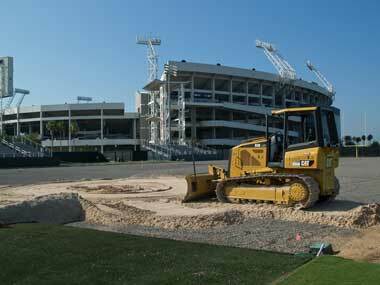 We provide contractors in Brooksville, Daytona, Gainesville, Jacksonville, Lake City, Lakeland, Ocala, Orlando, Palm Bay, Perry, Sarasota, Tallahassee, Tampa and Tarpon Springs with parts and service for all types of heavy equipment and construction equipment. mikeroweWORKS is a PR campaign for hard work and skilled labor. Its purpose is to call attention to the growing skills gap in the trades while providing a comprehensive resource for anyone looking to investigate a career in those vocations, as well as focus the country on the very real issues facing our trade workers and farmers. In addition to the trade resource center, Mike has established the mikeroweWORKS Foundation to help fund scholarship programs and other initiatives that reinvigorate Trade School enrollments and industrial arts programs around the country. Work tools for your compact construction equipment can help you stay on budget. Renting work tool attachments is a good way to stretch your budget—and the versatility of your construction equipment. Not only do they get the job done; they don’t have to be stored! Backhoe work tools expand skid steer loader capabilities with a side-shifting backhoe arm that eliminates the need to transport an additional machine to the jobsite and freeing the machine for work on other projects. Hydraulic hammers turn skid steers, backhoe loaders and small hydraulic excavators into pulverizers to break up concrete, asphalt and large rocks for easier removal from the job site, or to allow access to buried utilities. Pickup, utility and angle brooms help skid steer, backhoe and wheel loaders remove dirt, rocks and gravel from sidewalks, roads and parking lots. Multi-purpose buckets are hinged to help a variety of construction machines scrape, scoop, grapple and dig. Grapple buckets are made to handle large, irregularly shaped items such as tree stumps or storm debris. General-purpose buckets are good for digging, grading, loading and material handling tasks. Side-dump buckets help meter out materials evenly and load trucks in confined spaces. Ditch-cleaning buckets keep excavators dry with drainage holes that retain the solid material and allow water to run off. Light material buckets handle loosely packed materials like wood chips or mulch. Compactor plates help hydraulic excavators compress dirt or pack down gravel prior to pouring sidewalks placing foundations. Thumb attachments expand a backhoe loader’s ability to move and carry irrigation pipe, fallen tree limbs, or other large objects. Cold planers help skid steer loaders mill road surfaces to a desired level prior to resurfacing and can also remove traffic lane stripes. Wheel Saws allow skid steer loaders to cut through concrete. Augers in a wide range of bit sizes help speed up tree planting and fence post installation. Landscape tillers help skid steer loaders break up hard-packed soil for seeding or sod placement. Landscape rakes help skid steer loaders remove rocks from tilled soil. Mulchers and brushcutters help cut and shred vegetation from overgrown areas and undergrowth from forested terrain. Trenchers cut a neat, narrow trench with minimal disturbance to the surrounding soil. Ring Power can help you get more out of your machines and stay within your budget. 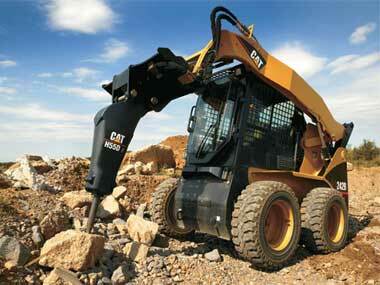 Call your Cat Rental Storerepresentative to discuss how work tool rental might best suit your needs. Know the effects of contamination on your heavy equipment, forklift or machinery's hydraulic system. Hydraulic fluid contamination has the potential to damage your entire hydraulic system in two different ways. From 75 to 85 percent of all hydraulic pump, motor, cylinder and valve failures can be traced to fluid contamination. 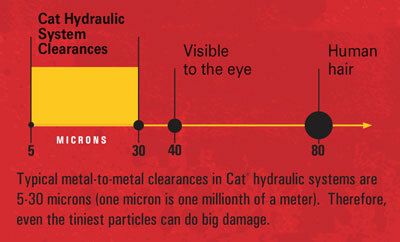 Due to the extremely small tolerances of today’s hydraulic systems, even particles that can not be seen by the naked eye can cause damage to your hydraulic system, leading to costly repairs. Machine productivity and efficient hydraulics go hand-in-hand. If a hydraulic system isn't performing at peak efficiency, it's robbing machine performance. Efficiency losses occur gradually, and can decrease productivity by as much as 16-20 percent before being detected by the operator. Over time, these "invisible" efficiency losses can also lead to increased fuel consumption. Hydraulics Xpress' exchange cylinders are in stock and ready for installation. Our highly qualified service technicians repair and rebuild hydraulic components on all equipment makes and models. Our state-of-the-art hydraulic shops are equipped with precision mills, long bed lathes and the latest welding equipment. Our hydraulic cylinders come with a warranty of 1 year or 2,000 hours, whichever occurs first. Get a quote from Hydraulics Xpress for your hydraulic cylinder repair, as well as hydraulic pumps and motors of all makes and models, including Rexroth, Sunstrand, Denison Vickers, Linde and others. 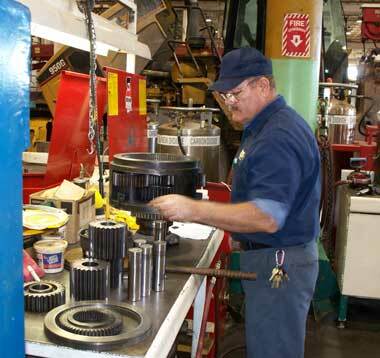 Hydraulics Xpress: we repair all hydraulics regardless of make or model of equipment or industrial machinery. We're located throughout North and Central Florida, with repair facilities in Tampa, Orlando, and St. Augustine. Phone toll free with any questions at 1-877-733-5120. Oil Analysis and fluid testing is the most reliable way to see what&#39;s going on inside your construction machinery, engine and hydraulic systems. Ring Power’s Fluid Analysis tests and analyzes oil, hydraulic fluid and coolant to help keep your systems running at peak performance. Ring Power’s Scheduled Oil Sampling, or S•O•S, monitors the overall health of your engine, hydraulic system, and cooling system. Our Lab performs a series of tests on oil, hydraulic fluid, and coolant to detect problems early and reduce or prevent unnecessary repairs. Machine fluid testing helps to avoid costly repairs, helps keeps operating costs lower and keeps you more profitable. 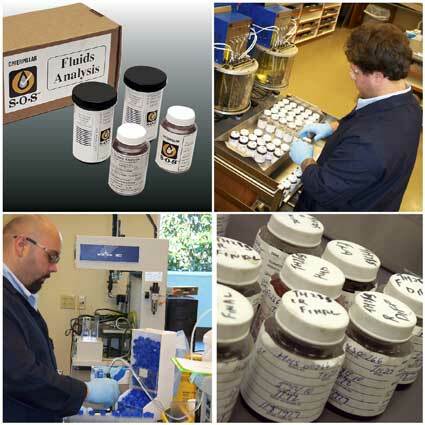 After receiving the oil, hydraulic fluid or coolant sample(s), each is thoroughly tested and analyzed. Ring Power’s Fluid Analysis Lab provides a detailed report of the analysis, along with maintenance suggestions and recommendations once the samples are processed. Machine or engine samples needing attention will be communicated immediately by e-mail, fax, and/or phone. Equipped with all the latest spectrascopes, inductors, gauges and computers, our Fluid Analysis Laboratory ranks as one of the best in the nation. • Wear Metal Rate Analysis measures 14 wear metals in ppm. Driving a special-themed Caterpillar Chevy Impala, commemorating Dale Earnhardt’s induction into the NASCAR Hall of Fame, Jeff Burton and the No. 31 Richard Childress Racing team overcame a 17th-place starting position to finish third in the annual Sprint Showdown 40-lap event. The race, which precedes the yearly All Star event, consists of two 20-lap segments where both green flag and caution laps count toward the first 20 laps, followed by another 20 laps where only green-flag laps are scored. Friday’s opening day gave the 29 entries an 80-minute practice session so they could fine tune their race cars for Saturday night’s contest. The Todd Berrier-led team meticulously used every second of the session and when it was all said and done, the Cat Racing team was listed second on the scoreboard. Later that night, Burton was slated to roll of the grid 17th in the qualifying session and toured the 1.5-mile oval fast enough to position himself right behind the provisional pole sitter. But, with four cars left to make qualifying runs, Mother Nature swarmed the Concord area and delayed the time trials session for rain. Track-drying efforts, coupled with a race against the clock to get the Camping World Truck Series race in, forced NASCAR officials to cancel the Sprint Showdown qualifying session and set the starting lineup based on qualifying order. Despite starting deep in the field, Burton & Company were overall pleased with the performance of the Caterpillar Chevy in Friday’s practice session and hoped that it would translate over to the 40-lap brawl. The RCR entry did not disappoint. The veteran driver moved into 12th just two laps in, 10th on lap six, and cracked the top five at lap 12. Tussling with a machine that was tight through the middle of the turns and loose on the exits, a caution on lap 17 provided an opportunity for Berrier to summon Burton to pit road where the veteran crew chief called for a two-tire pit stop that included air pressure adjustments. Restarting fourth, the 21-time Sprint Cup Series race winner narrowly missed a three-car racing incident that placed him fifth for a 19-lap shootout. The South Boston, Va., native traveled to fourth on lap 23 and into third on the ensuing lap, where he spent the remaining laps trying to reel in the second-place car. But, the handling on the Caterpillar Chevy shifted to the tight side in the closing circuits and Burton couldn’t make up any time on the frontrunners, taking the checkers third. Martin Truex Jr. captured the win while Greg Biffle crossed the line second, posting finishes that allowed both drivers to transfer into the All Star Race. Burton, Paul Menard and Marcos Ambrose rounded out the top-five finishers. Burton’s RCR teammate Clint Bowyer retired to the garage early after making contact with the wall, resulting in a 23rd-place finish. Fellow stablemate Kevin Harvick competed in the All Star Race where he finished sixth. NASCAR Sprint Cup Series racing continues at Charlotte Motor Speedway next weekend for its annual longest race on the 2010 circuit. Flag-to-flag coverage of the Coca-Cola 600 will take the green flag Sunday, May 30, beginning at 5 p.m. Eastern Daylight Time. The race will be televised live on FOX and broadcast on the Performance Racing Network and Sirius XM Satellite Radio. Qualifying for the 13th points-paying race on the 2010 schedule will be telecast live on SPEED Thursday, May 27 beginning at 7 p.m. EDT. 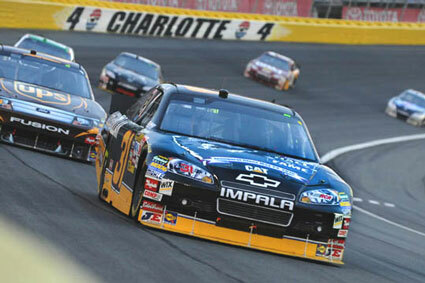 Location: Charlotte Motor Speedway – Concord, N.C.
Ring Power's virtual storefront, storefront.ringpower.com, has a great selection of Cat Racing apparel, Caterpillar scale models, Cat Racing t-shirts, Cat hats and more. Ring Power Corporation, North and Central Florida's Caterpillar dealer, is headquartered in St. Augustine, Florida, with branch locations in Brooksville, Daytona, Gainesville, Jacksonville, Lake City, Lakeland, Ocala, Orlando, Palm Bay, Perry, Sarasota, Tallahassee, Tampa and Tarpon Springs. Ring Power is comprised of eight divisions and has more than 45 years of experience servicing and supporting Caterpillar and allied equipment. Ring Power Corporation is proud of its professional, state-of-the-art, full service paint finishing facilities. Help restore and protect the value of your equipment with a reasonably priced, high-quality factory finish. Your equipment, whether it’s a bulldozer, truck, tractor, boat, crane, missile carrier or torpedo launcher- will be pressure washed, sandblasted, primed and painted with the utmost care and returned to you quickly, looking almost better than the day you bought it. When you bring a piece of heavy construction equipment to Ring Power for painting, your machine will be thoroughly pressure washed and sandblasted. Any body work or metal fabrication needed will be completed. Afterwards the entire machine is primed and painted. Lastly, any decals or graphics will be applied. -The paint shop is capable of refinishing all kinds of products, not just heavy equipment. 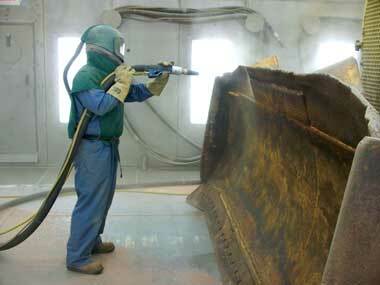 -Sandblasting is done using high-quality red garnet material. This removes old paint with superior etching for better paint adhesion. Take advantage of 0% FINANCING* offered by Ring Power on major Caterpillar® component repairs! From now until the end of 2010, all parts and labor totaling more than $5,000 (attachments, work tools, rebuilds, repowers, engines, undercarriages) will qualify for the special financing, and purchase can be combined to reach the $5,000 minimum. For more information about Ring Power’s 2010 Component Rebuild Stimulus Program, or to schedule work at one of our service centers, contact your Product Support Sales Representative today! *0% financing provided through CAT Access on all eligible repairs performed before the end of 2010. Must be pre-qualified by Ring Power and approved by Caterpillar Financial Services Corp. Offer based on current financial information and may be withdrawn or revised at any time without notice.